Metal Gear Solid: Peace Walker is the fourth Metal Gear game for the PlayStation Portable and the first portable title in the series to be directed by Hideo Kojima. 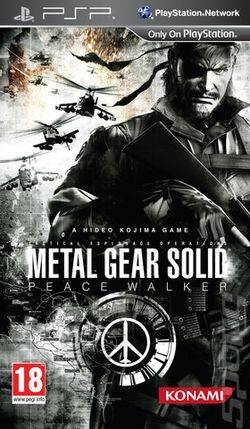 Peace Walker was originally released in 2010 only for the PlayStation Portable; an enhanced version for the PlayStation 3 and Xbox 360 was released in 2011. This version was sold on its own as Metal Gear Solid: Peace Walker HD Edition, as well as part of the Metal Gear Solid HD Collection. This page was last edited on 6 November 2014, at 11:11.